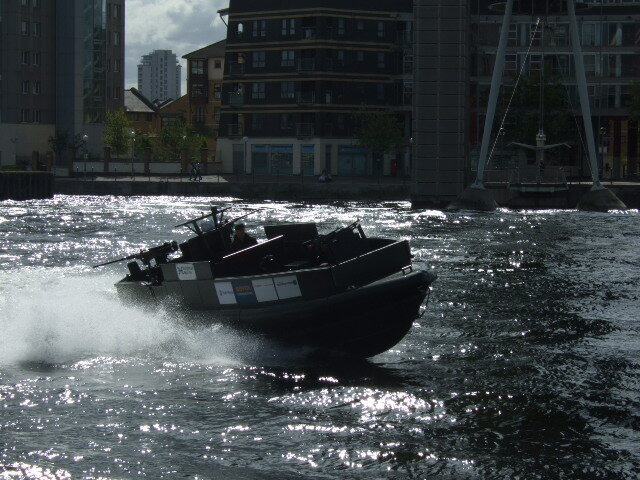 Holyhead Marine exhibited its new Mid Console Variant of the Offshore Raiding craft this week at DSEI 2009. Piloted by the Royal Marines of 539 Assault SQN the craft put on quite a show for spectators at the Royal Victoria Docks in London. This is the latest variant on the successful ORC design in service with the Royal Marines and features a centralised console position to allow a 360° field of fire as well as improved ballistic protection. The boat has been designed primarily as a gunboat and visitors were impressed by its combination of manoeuvrability and firepower. The boat and crew have just returned from operation Taurus, a routine deployment of the Royal Navy’s Amphibious Task Group, taking in the Mediterranean, the Arabian Sea, the Indian Ocean and the Far East.